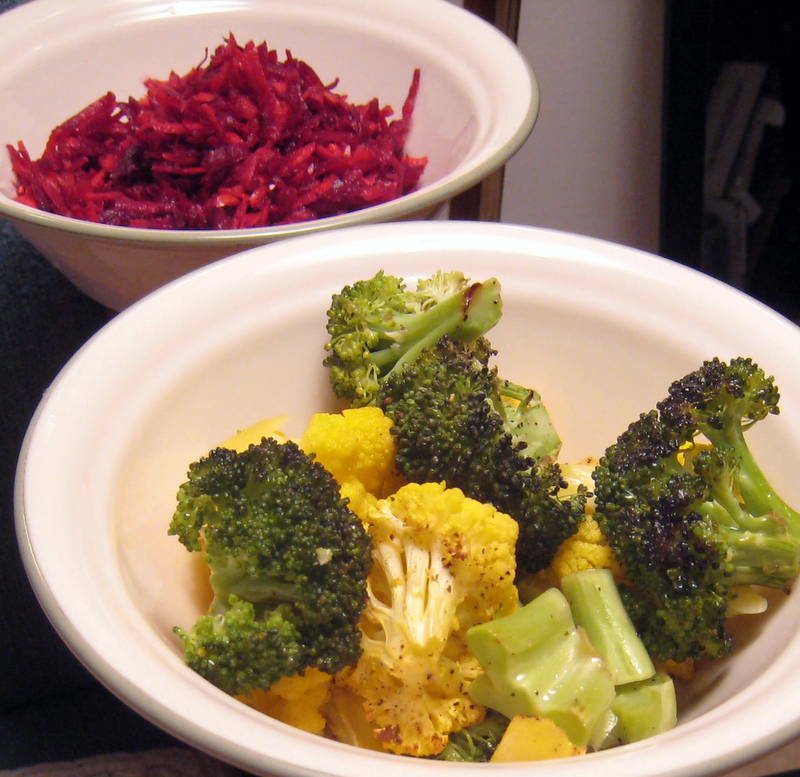 Roasted broccoli and cauliflower, beet and carrot salad, hummus with roasted garlic (not pictured). Our CSA is so awesome! Welcome back! 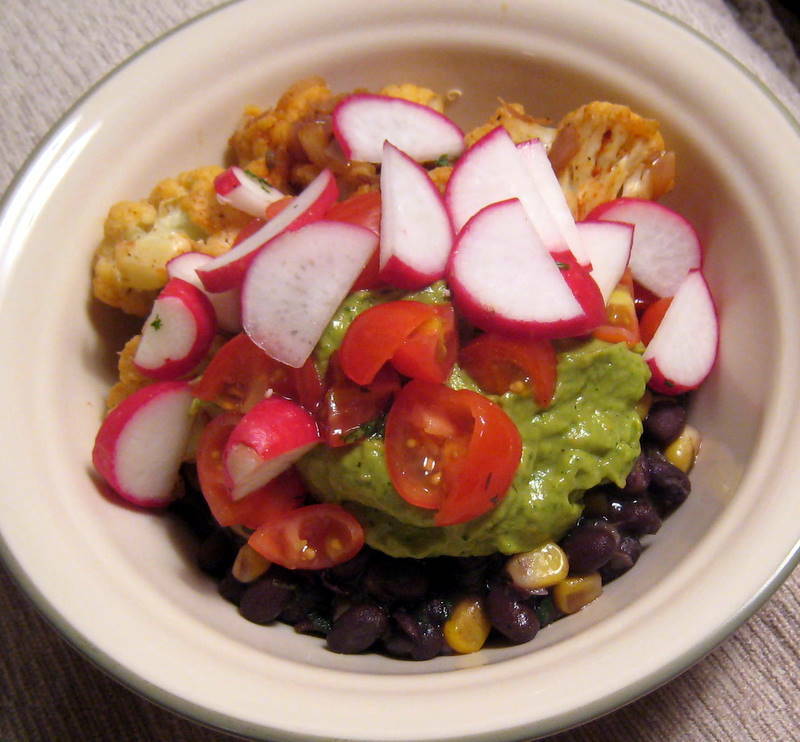 It’s Vegan Mofo Day 2 and we’re really impressed with all of the bloggers! Thanks so much for stopping by our little corner of the interwebs, it really means a lot to us. Also, in ginger beer news, the second batch is going well. Due to a number of user errors and placing the brew in a spot that was just not warm enough, I can see how things went horribly awry. This batch, however, is foaming nicely and smells like gingery goodness. Melt the Earth Balance over medium heat in a large stock pot. Add onion, jalapeno, ginger, and garlic and cook about 5 minutes, then add spices and stir well. Add broth, potatoes, cauliflower, nd bring to a boil. Cover, reduce heat and simmer until potatoes are very tender, about 20 minutes. In a non-metal bowl, whisk together non-dairy milk, yogurt, and lemon juice, set aside. Reduce heat to low. 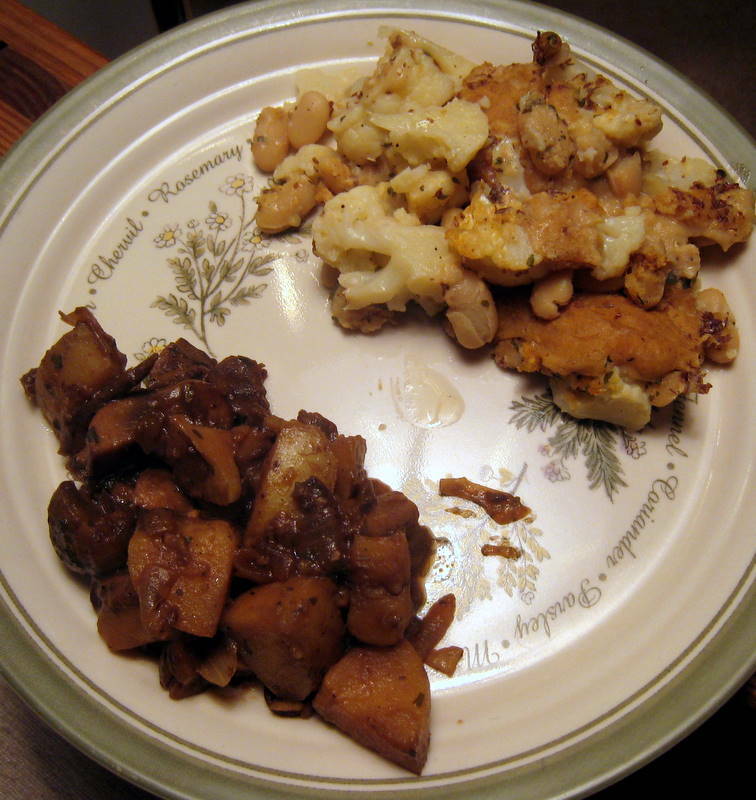 Reserve 3-4 cups cauliflower and potatoes and set aside. Using an immersion blender (or regular blender, be careful!) puree soup until fairly smooth. 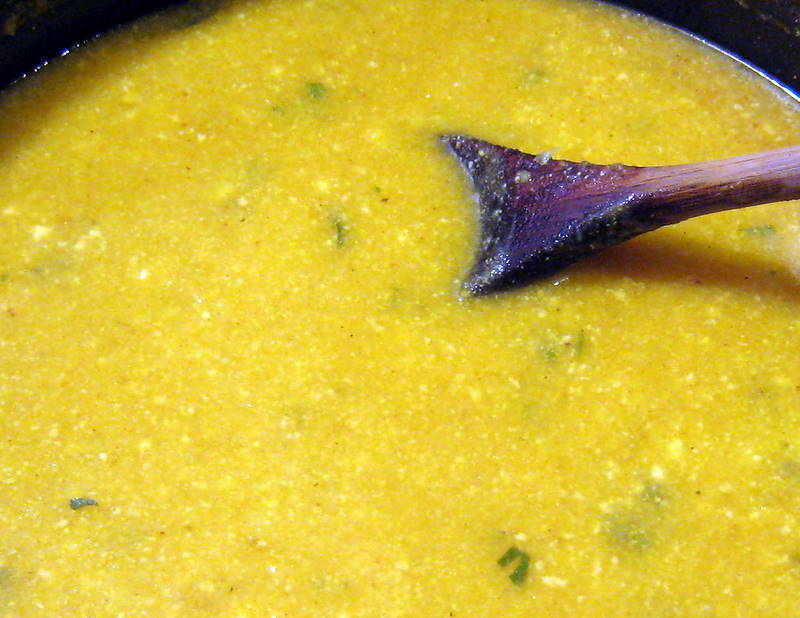 Return reserved vegetables to soup on low heat. Stir yogurt mixture and cilantro into the soup. Taste for salt and pepper. We had this with a spinach, mushroom, and tomato salad! It’s also good over a little rice, or rice/quinoa combo. Our CSA included two GIANT tomatoes this week, so we pulsed up one yellow/pink/orange one and part of the red one for this sauce, with garlic, ginger, jalapeno, mustard seeds, onion, curry, cumin seeds, and lime juice. Then we chopped up one head of cauliflower and added one can of drained chickpeas, covered and simmered for thirty minutes. 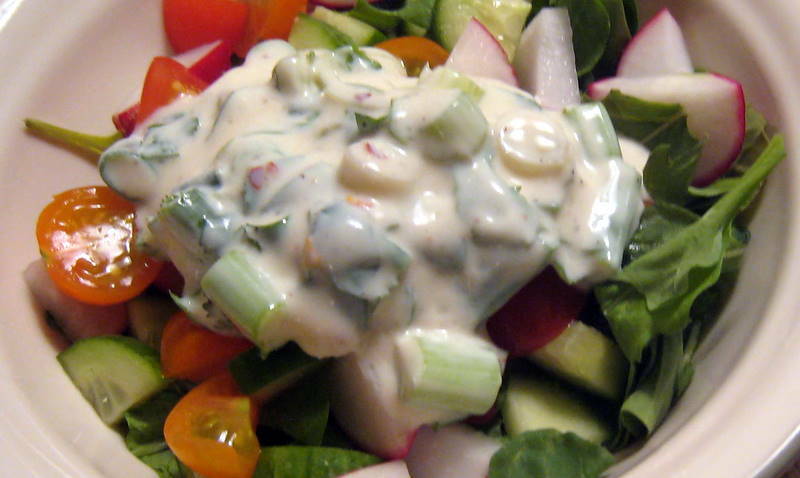 Served with this salad of arugula, cherry tomatoes, radishes, cucumbers and topped with soy raita. This looks fancy, but it’s really just a vegan white sauce made with rice flour, shallots, nooch, and a little sherry. 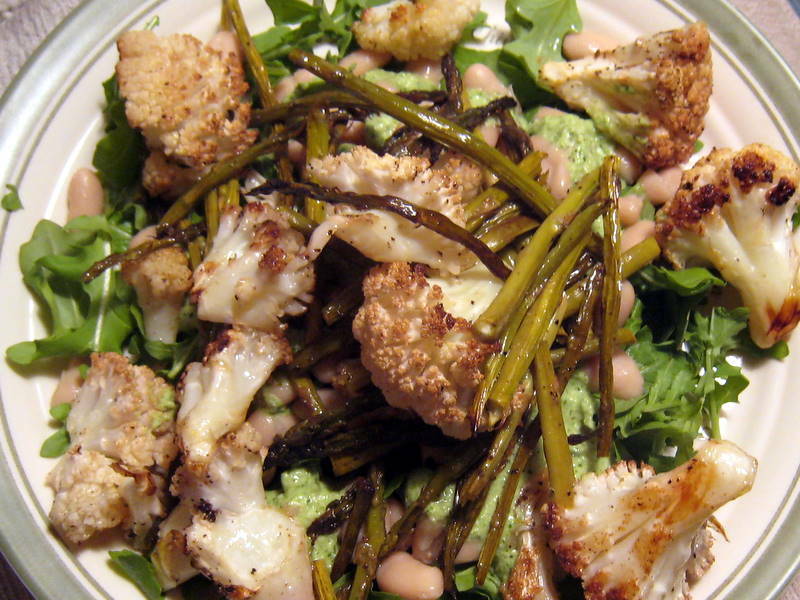 The cauliflower, asparagus, and mushrooms are tossed in olive oil with salt and pepper, and then roasted for about 15-20 minutes. In your bowl, layer the noodles first, then pile on the veggies, and toss them all together with the sauce. Look, we actually cooked something! This time of year with birthdays, holidays, finals, work, and lethargy, it’s just hard to do a lot of cooking. Last night, we decided to change it up and cook some new things, and they both turned out great! Preheat the oven to 400. In a pot, melt the butter and then add the flour. Cook about three minutes, then add the soy milk. Cook and stir with a whisk to prevent lumps. It should get thick in 3-5 minutes. Remove from heat. 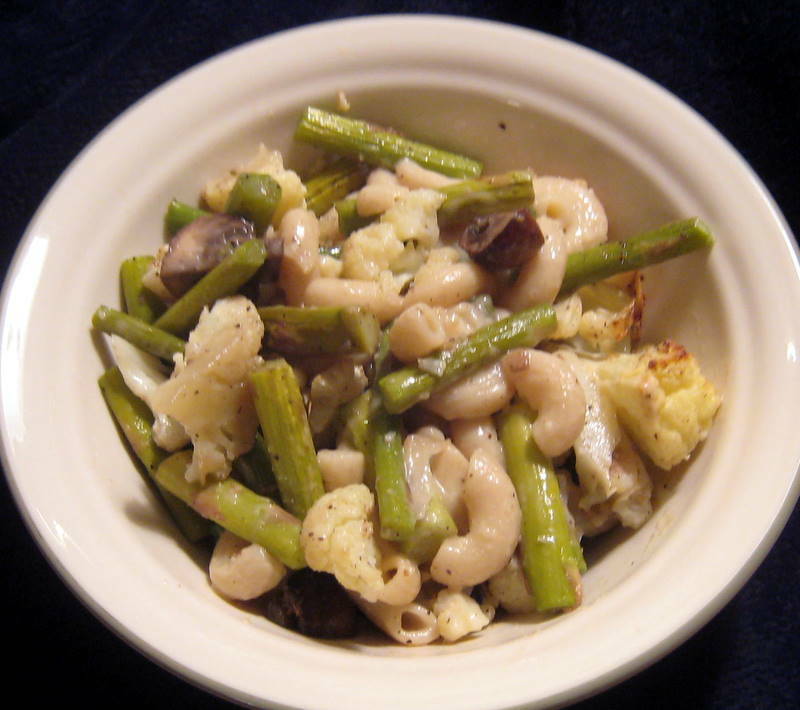 Place the cauliflower pieces in a large casserole dish, then top with white beans (with liquid). Season with salt, pepper, and parsley. Add half of the nutritional yeast. Then add the béchamel sauce from the pot. Top with remaining nutritional yeast and flax seeds. Add additional water so that there is a least ½ inch in the dish. Sprinkle more salt and pepper and drizzle olive oil on top. 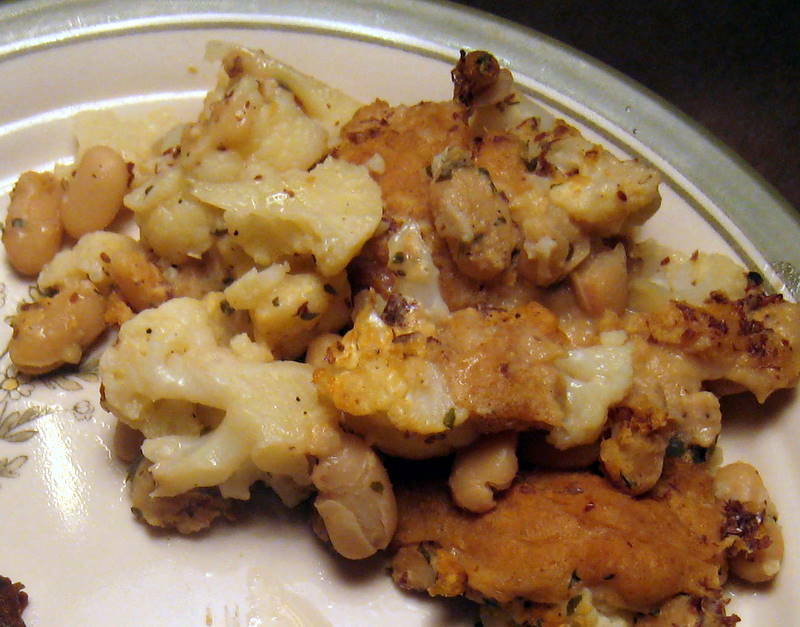 Bake about 45 minutes, or until cauliflower is very tender. Next time I would add a dash of turmeric as well! 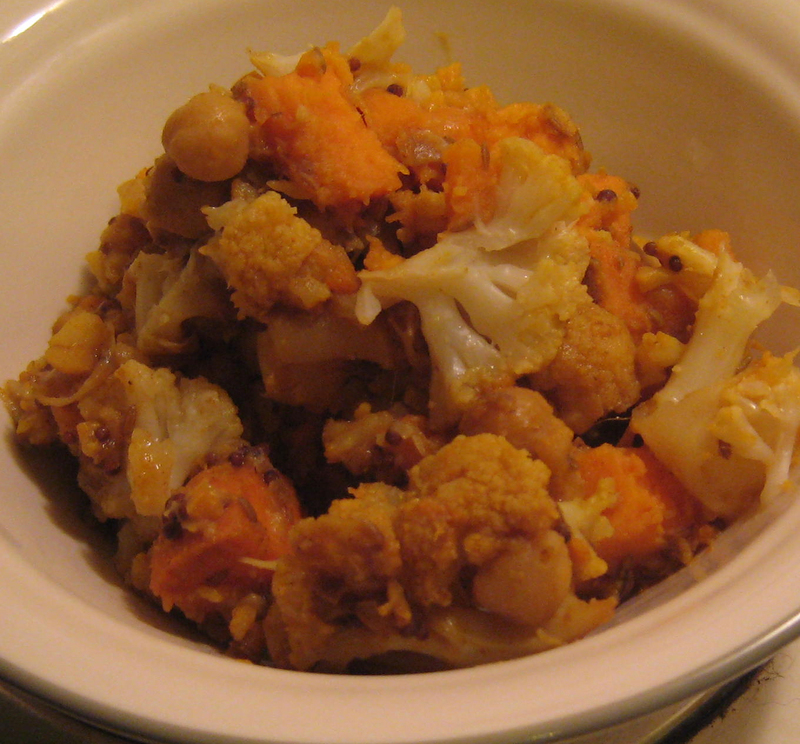 We copied the CopyCat Cook‘s recipe for Roasted Curried Cauliflower, and added two (local) sweet potatoes, 1 can of chickpeas, and increased the spices. Preheat oven to 375. Heat oil in a large dutch oven and saute the sweet potatoes for a few minutes. Mix the spices together in a small bowl. 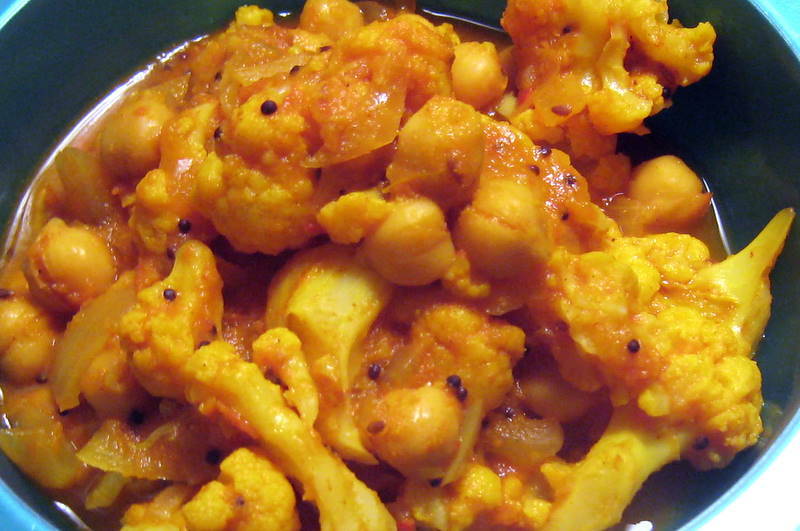 Add chickpeas with liquid and cauliflower and stir in the spices so that the vegetables are well coated. Bake uncovered about 45 minutes, stir every 15 or so. 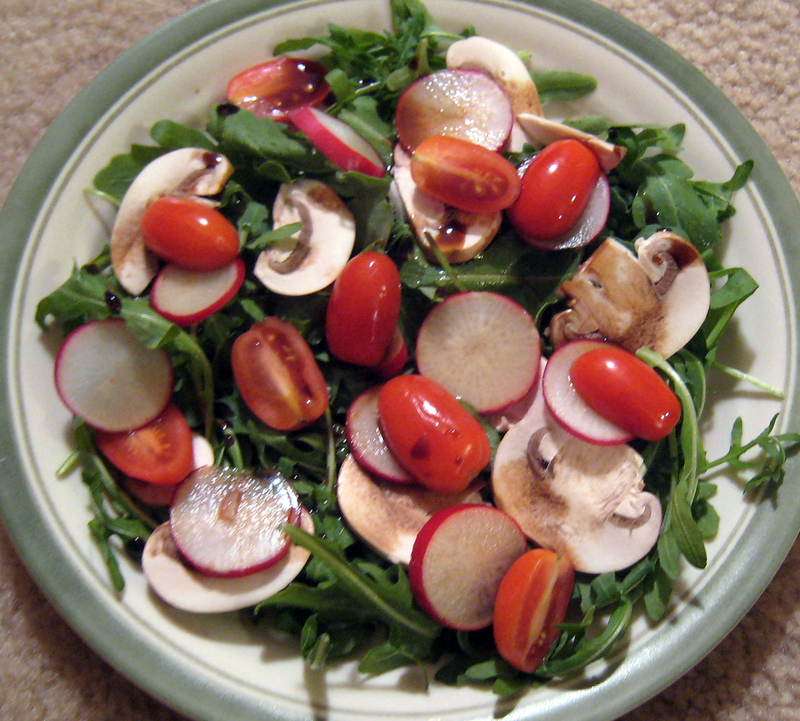 Serve with fresh little salad.